The impulse to make this movie was based, above all, on imagination. 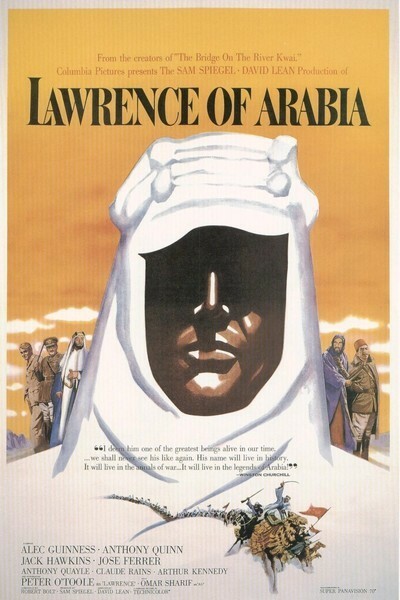 The story of “Lawrence” is not founded on violent battle scenes or cheap melodrama, but on David Lean's ability to imagine what it would look like to see a speck appear on the horizon of the desert, and slowly grow into a human being. He had to know how that would feel before he could convince himself that the project had a chance of being successful. There is a moment in the film when the hero, the British eccentric soldier and author T.E. Lawrence, has survived a suicidal trek across the desert and is within reach of shelter and water--and he turns around and goes back, to find a friend who has fallen behind. This sequence builds up to the shot in which the shimmering heat of the desert reluctantly yields the speck that becomes a man--a shot that is held for a long time before we can even begin to see the tiny figure. On television, this shot doesn't work at all--nothing can be seen. In a movie theater, looking at the stark clarity of a 70mm print, we lean forward and strain to bring a detail out of the waves of heat, and for a moment we experience some of the actual vastness of the desert, and its unforgiving harshness. By being able to imagine that sequence, Lean was able to imagine why the movie would work. “Lawrence of Arabia” is not a simple biography or an adventure movie--although it contains both elements--but a movie that uses the desert as a stage for the flamboyance of a driven, quirky man. Although it is true that Lawrence was instrumental in enlisting the desert tribes on the British side in the 1914-17 campaign against the Turks, the movie suggests that he acted less out of patriotism than out of a need to reject conventional British society, choosing to identify with the wildness and theatricality of the Arabs. There was also a sexual component, involving his masochism. T.E. Lawrence must be the strangest hero ever to stand at the center of an epic. To play him, Lean cast one of the strangest of actors, Peter O'Toole, a lanky, almost clumsy man with a beautiful sculptured face and a speaking manner that hesitates between amusement and insolence. O'Toole's assignment was a delicate one. Although it was widely believed that Lawrence was a homosexual, a multimillion-dollar epic filmed in 1962 could not be frank about that. And yet Lean and his writer, Robert Bolt, didn't simply cave in and rewrite Lawrence into a routine action hero. Everything is here for those willing to look for it. Using O'Toole's peculiar speech and manner as their instrument, they created a character who combined charisma and craziness, who was so different from conventional military heroes that he could inspire the Arabs to follow him in a mad march across the desert. There is a moment in the movie when O'Toole, dressed in the flowing white robes of a desert sheik, does a victory dance on top of a captured Turkish train, and he almost seems to be posing for fashion photos. This is a curious scene because it seems to flaunt gay stereotypes, and yet none of the other characters in the movie seem to notice--nor do they take much notice of the two young desert urchins that Lawrence takes under his protection. What Lean, Bolt and O'Toole create is a sexually and socially unconventional man who is simply presented as what he is, without labels or comment. Could such a man rally the splintered desert tribes and win a war against the Turks? Lawrence did. But he did it partially with mirrors, the movie suggests; one of the key characters is an American journalist (Arthur Kennedy), obviously inspired by Lowell Thomas, who single-handedly laundered and retailed the Lawrence myth to the English-language press. The journalist admits he is looking for a hero to write about. Lawrence is happy to play the role. And only role-playing would have done the job; an ordinary military hero would have been too small for this canvas. For a movie that runs 216 minutes, plus intermission, “Lawrence of Arabia” is not dense with plot details. It is a spare movie in clean, uncluttered lines, and there is never a moment when we're in doubt about the logistical details of the various campaigns. Law-rence is able to unite various desert factions, the movie argues, because (1) he is so obviously an outsider that he cannot even understand, let alone take sides with, the various ancient rivalries; and (2) because he is able to show the Arabs that it is in their own self-interest to join the war against the Turks. Along the way he makes allies of such desert leaders as Sherif Ali (Omar Sharif), Prince Feisal (Alec Guinness) and Auda Abu Tayi (Anthony Quinn), both by winning their respect and by appealing to their logic. The dialogue in these scenes is not complex, and sometimes Bolt makes it so spare it sounds like poetry. I've noticed that when people remember “Lawrence of Arabia,” they don't talk about the details of the plot. They get a certain look in their eye, as if they are remembering the whole experience, and have never quite been able to put it into words. Although it seems to be a traditional narrative film--like “The Bridge on the River Kwai,” which Lean made just before it, or "Doctor Zhivago," which he made just after--it actually has more in common with such essentially visual epics as Kubrick's "2001: A Space Odyssey," or Eisenstein's “Alexander Nevsky.” It is spectacle and experience, and its ideas are about things you can see or feel, not things you can say. Much of its appeal is based on the fact that it does not contain a complex story with a lot of dialogue; we remember the quiet, empty passages, the sun rising across the desert, the intricate lines traced by the wind in the sand. Although it won the Academy Award as the year's best picture in 1962, “Lawrence of Arabia” might have been lost if it hadn't been for the film restorers Robert A. Harris and Jim Painten. They discovered the original negative in Columbia's vaults, inside crushed and rusting film cans, and also about 35 minutes of footage that had been trimmed by distributors from Lean's final cut. They put it together again, sometimes by one crumbling frame at a time (Harris sent me one of the smashed cans as a demonstration of Hollywood's carelessness with its heritage). To see it in a movie theater is to appreciate the subtlety of F.A. (Freddie) Young's desert cinematography--achieved despite blinding heat, and the blowing sand, which worked its way into every camera. “Lawrence of Arabia” was one of the last films to actually be photographed in 70mm (as opposed to being blown up to 70 from a 35mm negative). There was a hunger within filmmakers like Lean (and Kubrick, Coppola, Tarkovsky, Kurosawa and Stone) to break through the boundaries, to dare a big idea and have the effrontery to impose it on timid studio executives. The word “epic” in recent years has become synonymous with “big budget B picture.” What you realize watching “Lawrence of Arabia” is that the word “epic” refers not to the cost or the elaborate production, but to the size of the ideas and vision. Werner Herzog's “Aguirre, the Wrath of God” didn't cost as much as the catering in “Pearl Harbor,” but it is an epic, and “Pearl Harbor” is not. As for “Lawrence,” after its glorious re-release in 70mm in 1989, it has returned again to video, where it crouches inside its box like a tall man in a low room. You can view it on video and get an idea of its story and a hint of its majesty, but to get thefeelingof Lean's masterpiece you need to somehow, somewhere, see it in 70mm on a big screen. This experience is on the short list of things that must be done during the lifetime of every lover of film. Based on Ebert's 1989 review of the restored “Lawrence,” here lengthened and revised.